This is a really disjointed post, written over a period of three days. Sometimes I start writing in one direction and I then see a car that takes me in another direction. I usually delete what I had written and start all over. This time I just kept adding to the original post. It also may be the longest post I've ever written. Long and disjointed... probably not a great combination. Oh well. As I mentioned in past posts, my dad worked for GM. At the time, being an exec at GM had its privileges. Not the least of which was getting to drive a lot of new GM cars, sometimes before they were in the showrooms in any serious numbers. That little perk was once amusing when my dad took some new Oldsmobile model (I forget what it was) on a trip to Massachusetts to see me. The car died. Since the car hadn't been delivered to dealerships yet, the local dealer had no parts for it in stock. In fact, the car my dad was driving - or at that point was having flatbedded - was the first one most of the dealership employees had seen up close. They all came out to look at it. They were all standing around talking about what a "great car" it was and how it was going to "save Oldsmobile". No one seemed to notice that this "great car" that was going to "save Oldsmobile" was IMMOBILE AND ON A FLATBED. Wow. To add insult to injury, at least for my dad, I spent the next few days chauffeuring him around in my 1980 Rover SD1. (Which never spent a moment on a flatbed and which I sarcastically offered to sell to him, an offer he didn't find nearly as amusing as I did.) Oldsmobile had to send a tech to the dealership to diagnose the car. They then had to track down the parts to repair it. My dad eventually flew home and the car was repaired and returned a few weeks later. 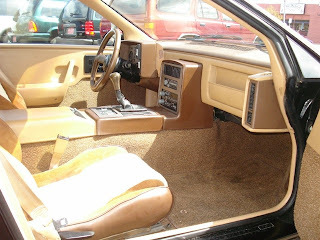 The Fiero was a parts-bin special. There's nothing wrong with that. Many of the sports cars we love were cobbled together from existing parts. Most turned out to be much better cars than their parts suggested they should have been. That was true for the Fiero. The Fiero's engine was GM's tried and true 2.5 liter 4 cylinder "Iron Duke". The rear suspension was actually taken from the front suspension of the Chevy Citation. The front suspension came from the Chevette. With its mid engine layout, all of this worked better than it had a right to, although handling wasn't spectacular. What didn't come from the parts-bin was the body. Not only did it look good, but it was innovative. 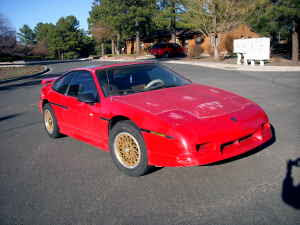 The Fiero had a steel space-frame covered with molded plastic body panels. Later GM would use that same technology on the Saturn. GM addressed that problem by offering their 2.8-liter V6 as an option in 1985. With the 4, the Fiero took over 11 seconds to reach 60. With the six, that time was cut to just over 8 seconds. 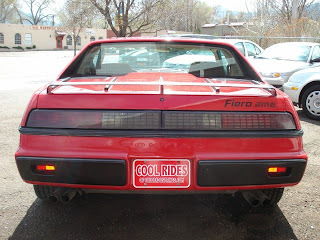 It was a 1985 Fiero V6 that I drove. As I said, it wasn't a bad car. It was awhile ago and I can't remember details, but I remember being impressed. If you're looking for a Fiero, avoid the 4 cylinder, unless you're truly looking for a cheap commuter car. The six is much more fun and really good ones can be found in the $3000.00 - $3500.00 range. The red car above is located in Colorado Springs. It's a little more expensive than the prices I quoted above, but it has just 38,000 miles on it and appears to be immaculate. You can find the Craigslist listing here. Buy a 1988 Fiero. In 1988 GM perfected the Fiero. It became the car it should have been in the first place. The suspension was all new, as were the brakes. The Fiero became a real sports car. 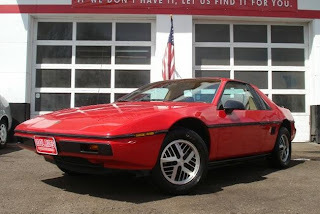 In typical GM fashion, they stopped producing the Fiero at the end of 1988. GM has done this so often, it's really no wonder why they're in the mess they're in. The Cadillac Allante is another example of car that became great the year it was discontinued. This 1988 Fiero GT could be a real bargain. It obviously needs paint and it's an automatic, but if it runs and drive well, the $1499.00 asking price is very reasonable. Located in Flagstaff, AZ, click here to see the Craigslist listing. Go crazy and go for this. This is a 1987 Fiero with a Cadillac Northstar engine it. This is a pretty lousy eBay ad. There are very few pictures and an almost non-existent description ("Rare, rare car. This thing screams! A father and son owned car in great overall condition. Equipped with custom installed Northstar V8" That's it. ), but it gives you an idea of what can be done. Located in Olathe, KS, click here to see the eBay listing.